Let your dreams be the light that guides you…. do what you love. That is the tag line on my website, and the ethos of my life. Our dreams show us how we want to live our life, who we want to be, they guide us to the places where we feel happiest and most content. Our dreams are the voice of our inner-self leading us ever onwards in harmony and grace, to peace and understanding. Dream Weaver is a blanket, or afghan, made up of different sized squares. 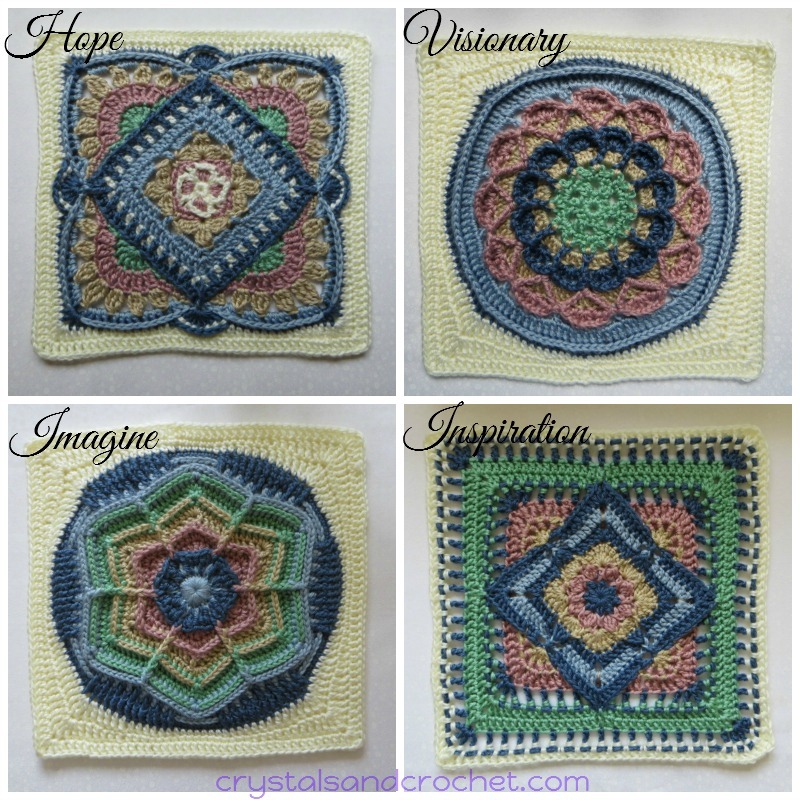 The pattern is, like all of my patterns, a full photo tutorial, including instructions for each of the squares, joining instructions and also the border. You can purchase the pattern in my Ravelry store. All the details of the yarn and colours I used are at the bottom of this post, as well as a link for you to purchase a kit of the yarn I used. First there is the centre square Star Gazer…… just allow your mind to take you to a beautiful, clear night, you gaze up at the night sky and see millions of stars, twinkling and shining down on you. This is when I know that we are all part of something amazing, and so vast it is hard to comprehend. This square measures 24 inches. Next come the four small squares, each square measures 6 inches. Muse is a flower with layers linked together, just like our dreams, one thought leads to another. Dream Catcher, believed to catch the bad dreams, and let the good ones pass through the web. Trance, so often we can get caught up in a web of our own making, but when we see clearly past our own doubt, we can allow our dreams to blossom and flourish. Possibilities, anything is possible, we just have to be bold! The 12 inch squares that surround all the others are……. Hope, there is always hope, no matter which way you turn, hope is what drives us forward into a better tomorrow. Visionary, is what we need to be, to follow our dreams and make them become our reality. Imagine, yourself living in your perfect world and you are already starting to create it. Inspiration, is the inner guidance that leads us forward to be all that we dream we can be. Before I give you all the details of the yarn and packs available I just had to share this photo too. I had taken the photos and was going through editing them and noticed a rainbow orb in the corner of this one…so I just had to share it. Rainbows have very special and magical meaning to me, and when ever an orb apears in a photo I know someone special is around. Finished size approx. 66 inches /5 ‘6”. I used Caron Simply Soft with a 5mm hook. The yarn packs are available at Woolwarehouse. ♥ Please remember this is my design and is covered by copyright law. You may share a link to this page with anyone, or to my Ravelry store, where you will find all of my patterns. You may do what ever you like with your finished items, but please do not copy or reproduce the pattern in any way. I am having trouble with the dream catcher. They bulge and won’t lay flat. Had anyone else had this problem? I’m a little confused – I am in the UK and want to make the Dream Weaver blanket, what size crochet hook do I need please? I think I need 5mm but not sure. Many thanks. it depends what yarn you are using, if it is the Caron Simply Soft then yes you need a 5mm as it is a worsted/Aran weight yarn. Thank you so much for your prompt response and yes it is the Caron Simply Soft yarn that I am using. I am making this gorgeous afghan for my niece for Christmas. I’d like to know if I can print the pictures and the description of each square on a card to give to her as well. I think that will tell her about the heart of the afghan. Please can you tell me what colours were used to make Melissa Leighton’s version. I have just purchased the pattern and I am trying to decide which option to use. Thank you for creating such a lovely looking pattern. Melissa used her own yarn, I will see if I can get the details from her. I made this afghan and the directions were awesome! It is huge, I was thinking it would be folded on the back of a sofa but it fits the top of a queen size bed perfectly, I love it! Repeat from * to * 4 times, omit last corner group. Join to standing hdc with a sl-st.
Stitch count: per side: 210 hdc, 1 corner dc. Repeat from * to * 4 times, omit last 2 bpdc. Join to 1st bpdc, fasten off, and secure ends. Stitch count: per side: 4 hdc, 210 bpdc. I am also about to upload a new pdf and send a message to everyone on Ravelry. You could skip 3 sts at each end of the row, that would take out the extra 2 sts which is throwing it off. In love..could you suggest an alternative yarn?…. Oh Helen! Dream Weaver is beautiful! So, so beautiful. I will put her in my Ravelry account wish list! And such lovely colours too! This is so beautiful! And it’s in my favorite snuggly yarn, simply soft. I have to make this one. I accidentally found you by seeing the simply soft kit at wool Whitehouse. I am so glad I checked it out. Wool pack (from wool warehouse) arrived today Plan to start later today. I have ordered the yarn pack and cannot wait to start this really gorgeous design. It will be an ideal wedding present for a couple who already have the usual home requirements – I know they will love it. So glad I found you! On round 8 of muse it states corner as (2tr, dtr, 2tr). I think this should be (tr, dtr, tr). Repeat from * to * 4 times, omit last 2 sc. Stitch count: Per side: 4 sc, 4 hdc, 4 dc, 4 tr, 1 corner dtr. I am a beginner to crochet but i love this design. Is the pattern detailed enough with photos of each step to enable a beginner to make this blanket. So far i have only made hats and done some tunisian crochet. Thank you for this beautiful pattern. I can’t wait to order the wool and make a start, I’m just finishing two identical blankets for my teenagers and was looking for something for us – it’s perfect! Can a sort of experienced beginner do this afghan? I learnt to crochette many years ago but never worked from a pattern until very recently. I will definitely buying your pattern and making your gorgeous blanket. Deramores are my suppliers of choice . I’m not sure about all the off-white ( I suppose another color might have overwhelmed the design ) but “wow” was still my heartfelt reaction. I want to do that, though I don’t know when I’ll find the time ! Aside from a fulltime job, I’m already doing your delightful mandala madness and assorted amigurumi for family and friends and a couple others blankets ( I’ve never been able to limit myself to reasonable craft ambitions ). Your Rose of Avalon interests me too, but I cannot decide which color scheme I prefer. Hi Helen , love your design – it’s a beautiful design! Could you tell me if your pattern is in UK terms? Does it come with photos or just written? Another gorgeous design! Thank you! I Love your Mandela Madness and your Dream Weawer. I Just have bought your pattern and I can’t wait to croche this blanket. Du er en dygtig designer. This is such a gorgeous pattern and what a beautiful story behind each square. Thanks so much. 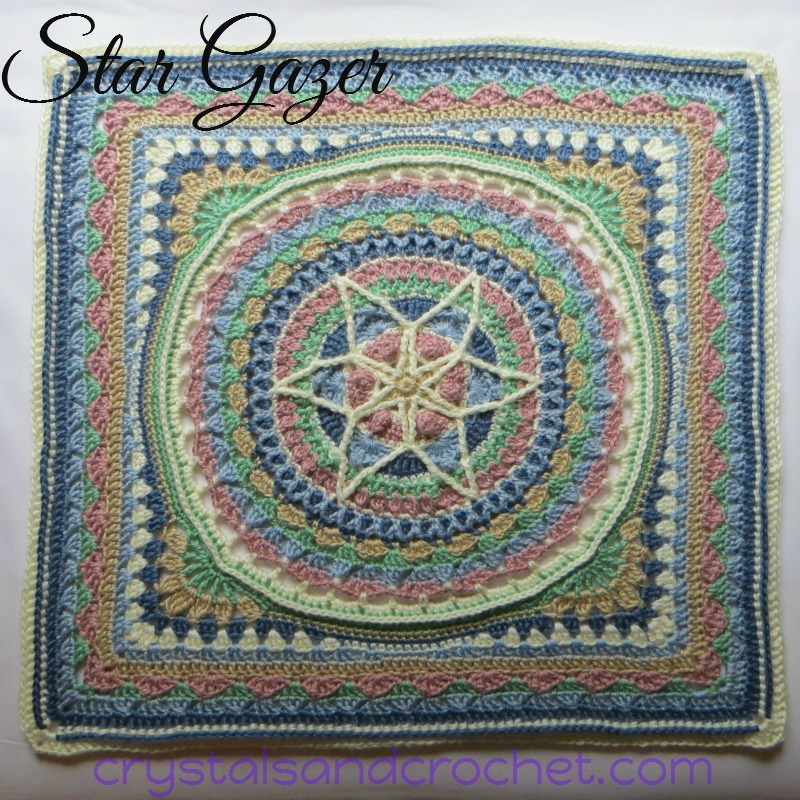 I love your colors in this new Dream Weaver.Will be ordering it very soon.I don’t know if I can start it soon but then there is the coming winter. Oh my goodness, I am in awe of the beauty that you continue to create! Thank you so much for being willing to share your gifts of crochet, imagination, Spirituality and beauty with the world. This pattern is love at first sight! I already bought it.Thanks a lot for your wonderful work! awesome, Awesome, AWESOME…..love, Love, LOVE your designs! Helen i think you are doing a wonderful, if not fantastic job, i love how you bring everything together, i love all that you do, you are a awesome instructor. I LOVE anything and everything to do with crafting and creativity. Nothing gives me more pleasure than helping others to learn and achieve their dreams. You can also find me on Facebook and Pinterest, by clicking the little icons at the top of the page. Subscribe to our newsletter and keep up to date with all our news.